Any legal resident of the United States who has reached his/her eighteenth birthday may become a Full Member or Regular Member of the Organization with voting and access privileges on approval of the Membership Committee and with payment of current dues, initiation fee and a maintenance fund. It is recommended all members of the Club should also hold current membership in the National Rifle Association of America. The annual dues of the Organization shall be $5.00, are not pro-ratable, and shall be payable at the time of application and on or before the first day of October of each subsequent year. The annual maintenance fee, a sum to be set by the Executive Committee and passed on by a majority vote of members present at an Annual Meeting. Currently $120.00/year. This sum shall be payable on or before the first day of October in each year. Any member who is not paid in full by October 31st shall be considered in arrears and shall cease to have Club privileges. The Maintenance Fund shall be used for building maintenance and operating expenses. Click here to see the current Fee Schedule. A spouse of a Regular Member may become an Associate Member with voting and access privileges. The annual maintenance fee, a sum to be set by the Executive Committee and passed on by a majority vote of members present at an Annual Meeting. Currently it is $60.00/year for an Associate member. This sum shall be payable on or before the first day of October in each year. Any member who is not paid in full by October 31st shall be considered in arrears and shall cease to have Club privileges. The Maintenance Fund shall be used for building maintenance and operating expenses. All persons applying for Associate Membership shall pay this fee which is not pro-ratable. A Regular Member in good standing who has reached his/her sixty-fifth birthday by October 1, may become a "Senior Member". A Senior membeship fee is $65.00, ($5.00 + $60.00). Senior members shall enjoy all the privileges of a Regular Member. Your application and permit status will be reviewed by our membership committee. You will be invited to an orientation night. The meeting is designed to make you feel very comfortable with the Club operation, so when you come in by yourself, your will feel like you have been a member for 5 years and have no apprehension as to how to operate everything. Bring a Photo ID. We will verify your information. Bring your pistol permit to be verified by our membership team. Bring your pistol and 10 rounds of ammunition. Bring your payment for membership assocaited fees. Your first year will be prorated based on when you join. All memberships expire September 30th of each year. You will be required to sign a waiver to participate in activities on the range. You will be oriented to the club operations and safe operation on the range. You will be required to demonstrate you know how to safely handle your firearm and hit the silhouette target at 21 feet. If you are new to shooting, not to worry, an NRA Coach will assist you and make sure you are comfortable with your firearm and you are doing everything correctly and safely. Upon successful completion, we will complete additional paperwork and you will be issued a key fob for electronic access to the range. Safety FIRST - Firearm safety, courtesy and common sense will ensure no one gets injured. Unsafe behavior, consumption of alcohol, drugs or drunkenness at the club is grounds for loss of membership. The BRC range is primarily for NRA style Bullseye competitive target shooting, two handed target shooting and rimfire sporter rifle shooting. Combat shooting of any kind is ABSOLULELY NOT ALLOWED. Do not shoot at targets while they are being posted or retrieved. NO Draw and Shooting allowed, all shooting is done from the bench. The following types of Ammunition and guns are allowed. .22 and .17 caliber rimfire rifles may be fired on all shooting positions. No shotguns are allowed including pistols that fire 410 shotgun cartridges. Metallic jacketed and lead bullets may be fired on all positions. (Includes .32, .38, .380, 9mm, .357, .40, 10mm, .44 mag and .45 caliber hand gun ammunition). No rifle cartridges other than .22 and .17 caliber rimfire. Absolutely NO center fire rifle cartridges are to be shot at the club. Please do not violate this rule. Sign-in book on table by door. Sign in with date, time, name, $1 entry and reason. (Practice, etc) (Ask about one time $30 range fee) Guest signs in on separate line. Guests are allowed for a maximum of 2 visits. After that they are required to join the Club if interested in shooting at the BRC. All targets are supplied by BRC. Try using “used” .22 targets when shooting larger caliber hand guns to conserve targets. The BRC supplied silhouette target is the ONLY silhouette target to be used in the Club. The silhouette targets can be used on any shooting lane and may be placed as close as 21 feet. The green line painted on the floor and wall is the minimum 21’ distance. NO EXCEPTIONS. All other targets (except air gun targets) on should be mounted on the carriers and placed at 50 feet before being shot. Ready Room: ABSOLUTELY NO HANDLING OF GUNS IN READY ROOM. Individual range heaters are located on the left as you enter. Lights are located on the right as you enter. All range doors to be kept closed except for those positions actually being used. Close doors when done shooting. Very important in winter to maintain range temperature. Sweep up your brass after shooting. Place empty brass in the large brass container located by the range door. NEVER PLACE LIVE OR DUD ROUNDS IN THIS CONTAINER. Place dud ammunition in the empty plastic cartridge box marked DUDS located on the Range Officer’s stand next to the range entry doors. Never take used brass out of the brass container. That brass belongs to the Club. You may take home	what brass you shoot. Members are expected to pick up his/her own trash and targets. Used targets are	recycled and should be placed in the appropriate recycle bins after shooting. Paper and plastic are recycled in the yellow recycle bins on the shooting line. Turn off the range heater(s), range lights and exhaust fan (if it was used). Close doors between the range and ready room. Report any damage/breakage that occurs by leaving a note (used target) at the shooting position affected and on the yellow tablet located on the sign-in table. Do not try to repair the damage. Sign out; turn off ready room lights and Exit Club. When outside…double-check that the door is firmly closed and locked. Work parties are held at various times to repair and clean the Club. All members are expected to donate a few hours each year to support the range cleaning and work parties. 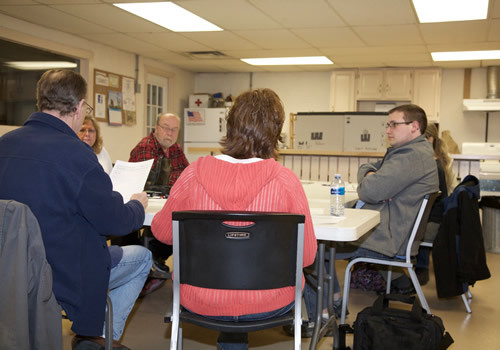 Executive Committee and general membership meetings are held each month on the last Thursday of the month. All members are encouraged to participate. The Annual meeting for the election of offices is held in May. The meeting schedule and Club activities are shown on the Club calendar and our Facebook page. Guests are allowed for a maximum of 2 visits. After that they are required to join the Club if interested in shooting at the BRC. BB guns: At least 8 years of age until 12 years of age under adult supervision at all times. Air rifle: At least 12 years of age under adult supervision.